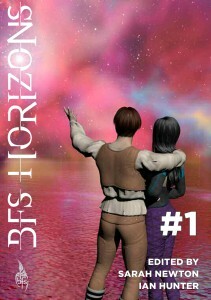 We have just sent out the last remaining print copies of BFS Horizons #1 to as many new members and renewals as possible, so it is now out of stock. Apologies to any new members who have missed out, but you will get access to the ebook and pdf versions via the next edition of our monthly members-only bulletin. Issue two will be going to press within a fortnight or so. It will include stories, poetry and most fascinatingly of all the minutes of our 2014 Annual General Meeting! Once again, we won’t be printing very many more copies than we need for our current membership, so if you aren’t a member, or your membership is on the point of expiring, join or renew now to be sure of getting your copy.